October 26, 2010 and March 9, 2011 video ad for ‘Apostle Rising’ released in “Out Soon” and “Out Now” versions, respectively. April 1, 2011 – Front cover and inside front cover of ‘The Bookseller’, a leading British magazine that reports publishing industry news. December 2010 – hundreds of post cards and bookmarks for ‘Apostle Rising’ were printed for BJB’s PR and Sales reps and included with every ARC and all sales and promotional mailings. In early 2011, posters were printed for booths at all expos and events for show and handouts along with the post cards and book marks. 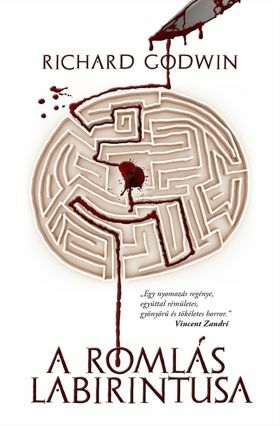 JD Mader reviews ‘Apostle Rising’ on Avoiding the stairs. 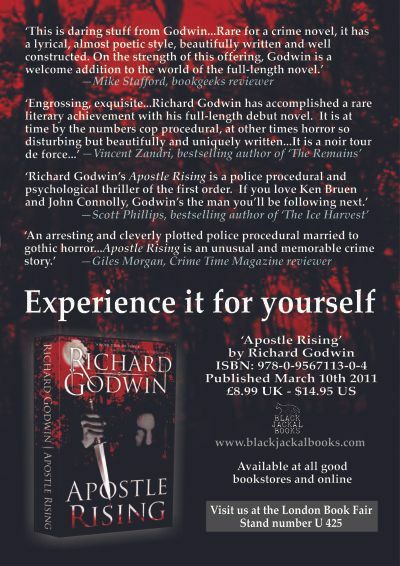 ‘Apostle Rising’ – Is Richard Godwin The Next Stephen King? ‘Apostle Rising’ by Richard Godwin.